Hey all! So I am not sure how I never found this site before now but it looks like there is a ton of awesome information on here and a lot of out of the box thinking. 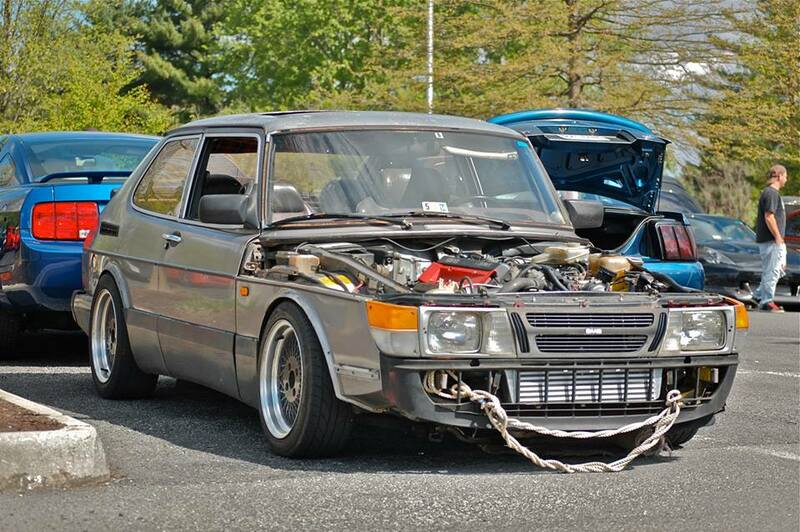 So quick history, I got a 1990 Saab 900 as my first car, within a year swapped a turbo engine in it and spent the next three years getting it running and learning about all the things I did wrong. After daily driving it for about 6 months I decided to really dive into the deep end and a couple weeks ago started and drove my baby with a compound turbo setup using the factory t3 and a holset hy35, and once again its terrible! Its almost all hodge-podged together and leaking from everywhere.. but it works! So now that I know it works the next step is a smaller primary turbo (the factory t3 lags more than I'd like) an external wastegate around the smaller turbo, a complete redo of the oiling system, then the fueling system will need upgraded and all the little things that will come in between so I have a long road ahead of me but I am excited that it works and I made it happen! And since no thread should be without pictures here is the car! Still waiting on a friend to send me some pictures of the turbo setup that he took.. so those will hopefully follow shortly. It's good to see another compound setup being done. Compounds are a great setup for street cars to get both good spool and good power. I'm in the process of fabricating a big twins sequential system, but if for some reason I can't get it to work properly, the fallback plan is a compound setup for my 2JZ Supra. That'll be silly!! So I am reworking the exhaust and getting ready to do the ewg but I am really unsure about sizing.. Ive heard everything from 38mm will be fine to 60mm bare minimum. I know bigger is better especially because I will be pushing more power/heat than the primary can handle on its own, but if I go too big wont it drop my boost pressure drastically when say a 60mm wastegate opens and then shut because the boost dropped and keep cycling like that? No, you can have whatever size wastegate you need and it won't cycle because they only ever open as far as they need to, to keep the boost at the specified amount. The small turbo will need a bigger wastegate than the large turbo as it will have a smaller turbine and housing AR that needs more exhaust gas to be bypassed. The more power (and hence exhaust gas) you make, the bigger both the wastegates need to be. E.g. An 800hp compound would probably run a 60mm wastegate on the small turbo and a 44mm on the large turbo.